Did you know the benefits of team building fold over into your company and reap many rewards that are unseen? Team building exercises can improve the effectiveness of the company! If you organize a team-building exercise, you will give your workers a chance to come together and break their daily routine. This gives them an opportunity to learn more about one another. You will have happier employees, meaning extended longevity, and in the long-term will benefit your company because you have satisfied experts working. In this article, we will examine twelve points that reveal why team building is so useful. Let’s start learning about how to increase the happiness of your employees while boosting their sense of responsibility. Keep reading to find out the benefits of team building! When you start a company, you want to have employees who work well together. When employees work well together, the overall success of the operation of the business increases. By having team-building exercises, you are giving employees a chance to work as a team. This will allow them to understand one another’s strengths and weaknesses. Having this knowledge will help them navigate challenges they might face more effectively. You want to choose team-building exercises that engage your employees. By selecting the right one, you are well on your way to building a team that works well together and are happier in the long-run. Let’s look at an example called the Egg Drop. This is a fun and hands-on activity that will take approximately 2 hours. It may make the workplace a bit messy. However, this is a standard problem-solving exercise that requires teamwork. To begin with, divide your team into two or more groups and then assign them each the task of creating an egg package that can withstand being dropped from 8 feet high. You’re going to need to give your team the proper tools and material. Have that handy. After they have built the egg package, ask each team to make a 30-second ad for the tools they used. Once they have presented their ad, allow the groups to let their eggs fly! This is a fun activity and teaches employees about teamwork and creativity. By working on an ad together, you need the team to come together and pool ideas. The egg drop is entertaining and competitive. Why not try this activity out for your next team-building meeting? You’re sure to have a lot of laughs and grow together. When working as a team, communicating is a fundamental need. If your employees don’t talk well, you will run into problems that can be easily avoided. Let’s talk about communication and how to encourage this with your team. When you pick an activity for your team, this gives employees a chance to practice communicating with one another in a less stressful environment. They have the opportunity to talk things out and ask questions. During the job, there isn’t much flexibility. A team-building exercise gives people a chance to understand one another better and how they interact. Some people are more straightforward than others. Some people have more difficulties with communicating, and they may need more help in this area. If you work on communicating during these activities, you will see vast improvements in the workplace. Everywhere from emails to face-to-face interactions, employees will understand how to speak with their co-workers. Set up a team-building exercise right away, if your workplace is struggling with communication! Team-building activities are enjoyable. They give co-workers a chance to bond. But it’s important to choose activities that your employees will enjoy. Another reason why you may want to consider hosting a team-building activity is that it gives your employees a chance to have fun! You want them to get to know one another and form positive relationships, right? This will overall increase the sense of satisfaction in your workplace. When employees must experience something new together, like the Egg Drop, for example, they will grow together and form positive feelings towards one another. This gives them a fun memory to reflect on and helps build their bond. Every team needs a leader. Effective team-building exercises require leadership from one or all members at some point in the game. Leadership is something that not everyone necessarily has in the beginning. But by engaging in team-building activities, most members get a chance to be a leader. By nurturing leadership abilities in your employees, overall there will be benefits that flow out on your company. Giving employees a chance to practice as the leader will allow you to see areas where they can grow or even contribute as a leader on a future project. You may be surprised by who is a great leader! By allowing people to grow their leadership skills, they will by default feel more confident. Confidence is a tremendous asset to have in a workplace. You want to make sure that when you have these team-building exercises they are in a space that is non-judgmental and not threatening. You want people to feel at ease. When employees get a chance to work together on a task, they must trust and rely on one another. This allows workers to understand one another better and maybe catch a glimpse of each others’ fears and weaknesses. They will also get a chance to see their fellow employees’ strengths. By providing a non-judgmental environment for the workers, you will be able to build a healthy work environment that will increase the sense of morale among employees. If you have strong morale among co-workers, their sense of satisfaction and motivation increases. They will have a desire to work hard and be proud of their company or business. Productivity is a huge issue that many businesses and companies struggle with. Did you know that by employing ice-breakers before your weekly meeting, this will give employees a chance to discuss what’s on their mind? It is a low-cost and effective way to help employees feel like it’s a safe place to share what’s on their mind. For example, you could use structured icebreakers. This will give each employee an equal chance to speak. This builds a strong sense of social sensitivity and allows each employee to learn about one another. You can also go the less controlled route. Instead, have everyone name a favorite television show. People will learn more about one another and perhaps realize shared interests. By having a chance to talk about various things before the official meeting, employees will feel more relaxed and happier, knowing they have been heard. When you have happier employees, productivity will increase. Don’t you love breaks in your routine? When you get a chance to do something different for the day, you feel lighter and more relaxed. Giving employees an opportunity to attend a team-building activity does precisely this. You give them a chance to do something fun but also mesh as a team and ultimately advance their performance at work. By creating a work environment that is satisfying, your employees will feel boosted. Your workplace will become a great place to work. The best thing an employee can say to a boss is that they are looking forward to their day at work. This suggests that they will be more productive, imaginative, and time-efficient. Problem-solving is an invaluable skill. When you bring your team together for an exercise, you are giving them a chance to solve a problem. By building their experience with problem-solving, employees will feel more independent and able to overcome problems in their workday. The best part about being able to problem solve is that an employee begins to feel more secure in his or her position. We already know how important confidence is in the work-place. This confidence will also transcend to other areas of a person’s life. You know those employees that don’t regularly work together? Why don’t you pair them up in a work-place exercise? This will allow them the chance to get to know one another and also problem-solve together. By putting together two different people, frequently more creative solutions and ideas emerge. People from various departments may look at a problem differently. Exposure to different perspectives will increase efficiency and creativity in the workplace. With team-building exercises, different employees come together in an encouraging and friendly environment. This will help build better relationships. Responsibility is a significant factor to consider in a company. Every person in a company or on a team has something to contribute. They are in a role that helps the company achieve the final goal. When an employee takes on responsibility, they must make sure they complete the task assigned to them, or it will be taken from them. Reward an employee when they have done well. Do this vocally so other employees will see this and desire the same recognition when they do something well. Team building emphasizes how responsibility is essential to the success of the group. If one member isn’t contributing to the activity, their group may suffer. Building that sense of responsibility is important for the company and the individual. Moving forward, the employee will have a sense of worth and value, knowing that they contribute something unique to the company. What is your organization’s work culture like? If you asked one of your employees what are some of the values behind their company, do you think they would know? By giving employees a chance to work together in a team-building exercise, leaders get a chance to share and reinforce what the vision of the company is. If an employee has a better understanding of this, the work culture will be a lot healthier. Team building exercises allow employees to understand their work culture at a fundamental level. This gives them a break from the desk and instead back to the basics of why what they do matters. Sometimes it is easy to forget the values of a company. When an employee is first hired, these are often discussed at the interview or post-interview. Give employees a chance to remember what the vision of the company is! Overall, team building activities can be structured in a way that actually focuses on a specific outcome. You can pick activities that tackle a new problem. Perhaps you want to brainstorm a new marketing strategy. By organizing a day where employees can gather together from various departments, you will have a room filled with diverse and creative people. When they all work together on a focused goal, you may be surprised by the outcome! Not only that but also overall, communication will increase between departments and this will help your company. The importance of team building can have lasting effects on your company and employees. Make sure to plan one of these events. 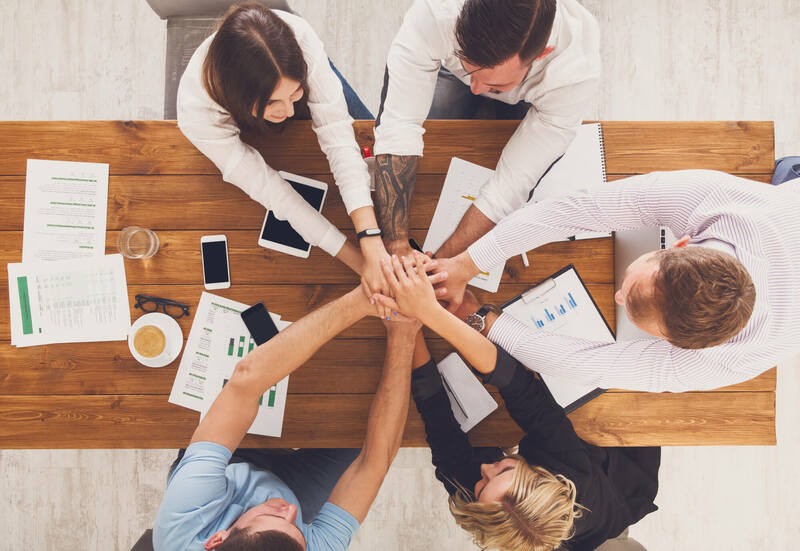 In this article, we went over several of the benefits of team building for your company. Employees learn how to work as a team, communication is improved, employees’ bond and leadership qualities can grow. Happiness and company morale are boosted, productivity improves, life-work balance makes work more fun, problem-solving skills grow, relationships among co-workers build, and responsibility is highlighted in these activities. Overall, your work culture is going to improve drastically. You want your employees to come to work motivated and excited, don’t you? Well, now is the time to schedule in regular team-building activities. You could even think about having them once a month. This will give employees something to look forward to and gives them a break from their day-to-day routine. Do you want to learn more about how to make your company more successful? Read our article about why branding your company is so important.